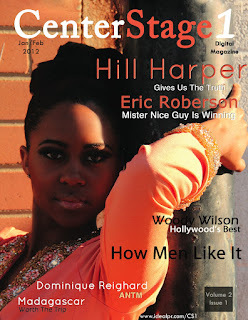 In the January/February 2012 issue actor and writer Hill Harper shares “The Truth,” a short film he directed and why the storyline hits home for many. Jazz musician Eric Roberson introduces his latest album “Mister Nice Guy,” and BET’s Sunday’s Best star Jessica Reedy shares her music, trials, and triumphs throughout the years. Also in this issue, we share how Woody Wilson became the go-to-guy in Beverly Hills for television and film fashion. America’s Next Top Model veteran, Dominique Reighard (Cycles 10 & 17) takes on other aspects of the entertainment industry. We found out what some of the world’s sexiest men like and showcase some vintage fashion looks without sacrificing the elegance. CenterStage1 Magazine continues to expose readers to an upscale blend of art, culture, fashion, and music in addition to well-known faces in “Thriving” as well as new artists in “Rising.” Have you ever thought about volunteering while on vacation? In “Places,” we suggest a different approach to eco-tourism, highlighting beautiful Madagascar for its ecosystem and natural resources. Also, discover great food and entertainment in our feature on Dishcrawl DC.